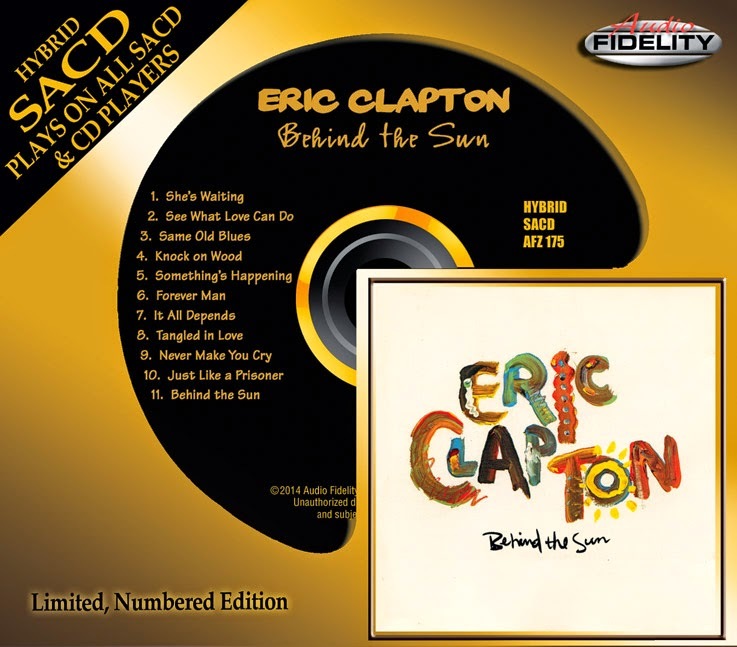 Camarillo, CA - Eric Clapton fans are buzzing with excitement over the release of his critically acclaimed 1985 comeback album 'Behind The Sun' on limited numbered edition Hybrid SACD on Marshall Blonstein's Audio Fidelity! The musical climate had changed dramatically from the days Eric Clapton had topped the charts in the '70s. 'Behind The Sun' is not his first album of the decade, but he obviously understood it was time to modernize his sound. After signing with Warner Brothers in 1983, Clapton bounced back on the music charts for the first time in five years, and solidified his return in 1985 with the instant success of 'Behind The Sun', his ninth album. Backed with a line-up of stellar musicians and producers Lenny Waronker, Rod Templeman and Phil Collins, Clapton for the first time in years now had several songs that reached a wider audience, scoring Top 40 hits with "Forever Man" and "See What Love Can Do." He didn't abandon his old music, he just blended it more effectively and brought the flavor up to date by mastering the more electronic sound of '80s radio. This album also had a heavy soul flavor with a really well produced version of Eddie Floyd's "Knock On Wood", and Clapton remained true to the blues with a brilliant eight minute track, "Same Old Blues", which contains some of his most electric playing of the era. The sessions featured Toto guitarist Steve Lukather and former drummer Jeff Porcaro, as well as Clapton's long-time collaborators, drummer Jamie Oldaker, bassist Nathan East and keyboardist Greg Phillinganes. Clapton's voice had a rich new depth, like whiskey aged to perfection. The recording showcased blistering guitar solos, a high-octane R&B beat and a slick synthesizer-backed production that was well-suited for the pop-rock market - The Guitar God was now serenading to a new generation of admirers and fans alike.